Horse and arena owners have many choices when it comes to bedding for their horses’ stalls. 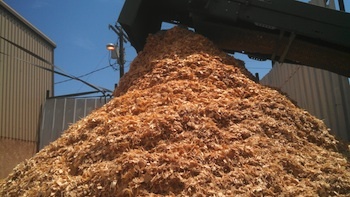 Wood chip bedding can provide many positive results for horses. Reduces the amount of stall maintenance, but remember to clean stall daily for the health of the horse(s). Providing quality bedding for your horse(s) can eliminate many health and safety issues for your horse(s). It is important that a horses’ stall be cleaned of soiled bedding at least once a day. This allows for a good place for the horse to bed, safety, and keeps bacteria growth down. AMC Consolidated provides high quality arena bedding for your stall needs. For further information regarding quality stall bedding you can contact AMC Consolidated for further details. ¨ Reduces the amount of stall maintenance, but remember to clean stall daily for the health of the horse(s). For further information regarding quality stall bedding you can contact AMC Consolidated for further details.